Alburgh – Margaret Neveau Silva, 96, a longtime resident of this community, and more recently of St. Albans, passed away peacefully, Tuesday July 4th, 2017, at the Franklin County Rehab Center. 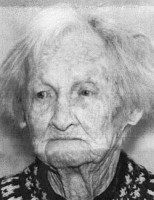 Margaret was born March 1st, 1921, and adopted by Charles Neveau and Edith Thompson. She loved life, she had a very inquisitive nature and a strong desire to learn. She enjoyed driving her car, quilting, making puzzles and playing cards. She is survived by several close friends and was pre-deceased by her parents. Margaret had excellent care during her last few weeks at Franklin County Rehab Center. Special thanks to all the staff for their love and support. At her request, Margaret will be buried at a private service at the family lot in Sheldon Village Cemetery. Gifts in Margaret’s memory may be made to the Franklin County Rehab Center, 110 Fairfax Road, St. Albans, VT 05478. Assisting is the Heald Funeral Home, where her on-line guest book is available to share a memory or offer a condolence at www.healdfuneralhome.com.